To Stuff…Or Not To Stuff! Oh, how I love Thanksgiving. I love everything about Thanksgiving! Family, friends, food, a fire in the fireplace…it’s all good! The menu is easy too. I make the same thing every year. What would Thanksgiving be without turkey, stuffing, mashed potatoes, sweet potatoes, sauerkraut (a Maryland tradition) and cranberry sauce. In my house broccoli casserole is also a must and because we don’t have enough carbs I make one more side dish… a delicious carrot cake. And yes! I stuff my turkey! I am not generally a risk taker but once in a while you just have to live dangerously! After all, the stuffing is the best part of the dinner! So tell me. Do you stuff your turkey? And even more important…….do you love Thanksgiving as much as I do? Sounds a lot like the Christmas meal we get (when) in England. Here in the Netherlands we don’t celebrate Thanksgiving or similar. I hope you have a wonderful day! Turkey looks beautiful….and…YES……I LOVE THANKSGIVING. Thanksgiving is a wonderful holiday. I don’t stuff my turkey, but I won’t even be cooking one for the second year in a row – we’re going out for the second year in a row. Today we go to my sister’s – she stuffs and bakes extra because we all love stuffing. 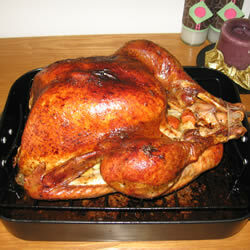 Tomorrow is turkey FRY day………no stuffing, just friends and turkeys. Is there no daylight savings time? According to this site, I’m late for my sister’s……….. Happy Thanksgiving! I’m a veggie, but I roast turkey for friends, and I say Stuff it! (I I always make some on the side in foil wrap for me. Yes, stuffing is the best part of the meal. Changed my mind! The Best part of Thanksgiving (other than family and friends)……..the leftovers! !